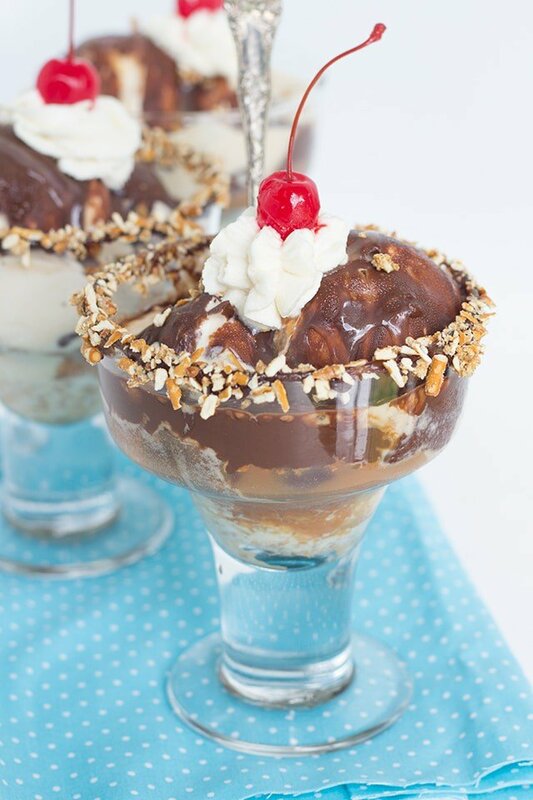 This sweet and salty sundae that will take all your worries away! I’m such a sweet and salty addict. I cannot get over how amazing it tastes to me. 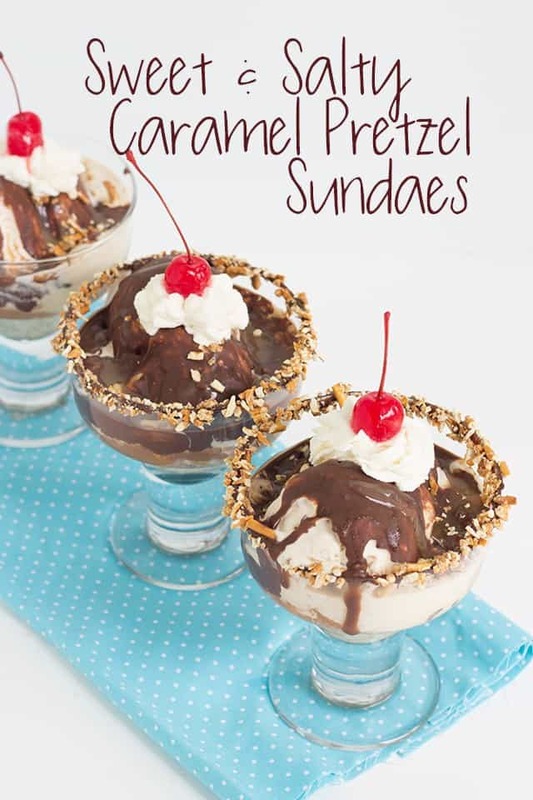 So of course I had to introduce you to my kind of sundae, the sweet and salty caramel pretzel sundae. It’s filled with a pretzel crumb, salted caramel ice cream, hot fudge and chocolate pretzel magic shell. Oh my goodness, I almost forgot that precious maraschino cherry that I topped each one with. No sundae should be without a cherry. I would like to introduce you to my technique of building a sundae. Add a little ice cream and fill it the rest of the way with toppings. I might be exaggerating just a hair, but not much more than that. Some of my favorite toppings are caramel, hot fudge, butterscotch and magic shell. What can I say? I’m a toppings kind of girl and I thoroughly enjoy turning an ordinary bowl of ice cream into something fun! 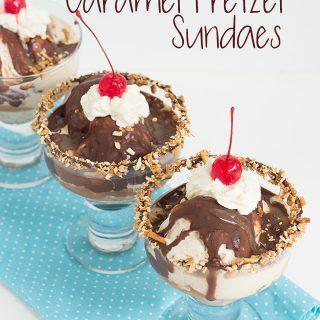 This sweet and salty caramel pretzel sundae is the perfect pick-me-up for any day. I have to giggle and I often joke with my husband because where we live right now there are literally like 4 or 5 ice cream shops on the same road. There might even be more, I’m not sure. The people in this area must love their ice cream as much as my family does! Place the crushed pretzels, melted butter and sugar into a bowl. Stir to combine. I used stick pretzels, but any pretzels will be fine. Spread the pretzels out onto a cookie sheet that has raised edges. Spread out the pretzels to give them room to toast up some. Bake for 13 minutes. Remove from the oven and let cool completely. In a mixing bowl, add in the heavy cream. Whip on high until it forms soft peaks. Add in the powdered sugar and continue to whip on high until stiff peaks form. Place in a piping bag with a 1M tip. Set aside. 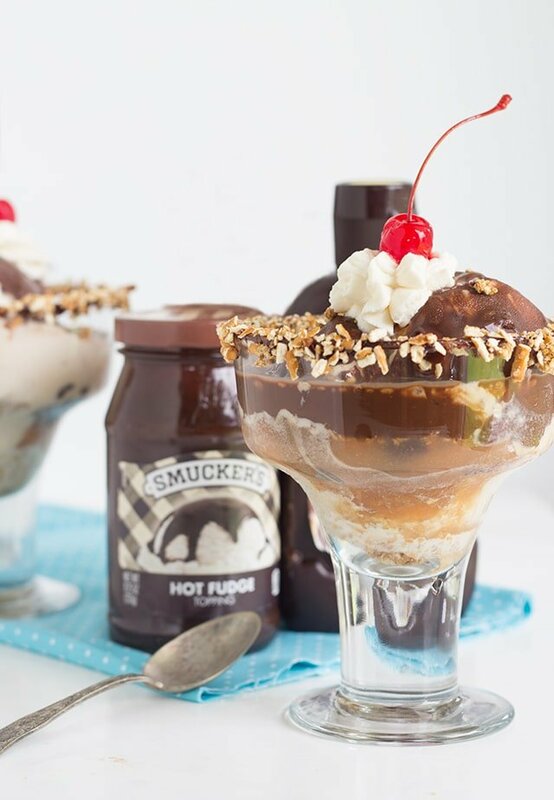 Rim the sundae glasses with some of the hot fudge topping. Press the rim into the crushed pretzels. Add about 2 tablespoons of pretzels in the bottom of the sundae glass. Add 2 scoops of ice cream to each glass. Remove the lid to the hot fudge topping. Microwave for 45 seconds. 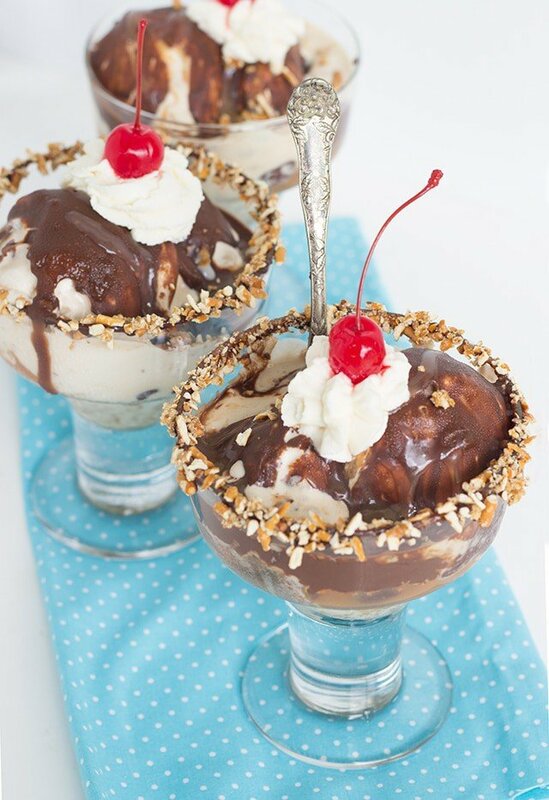 Drizzle 2 tablespoons of caramel and and 2 tablespoons of hot fudge to the ice cream. If you're a toppings person, add more if you would like. You can also add less if you choose. Drizzle a tablespoon of magic shell over top. Let the magic shell set up. Pipe a swirl of whipped cream on top of the ice cream. Top with a cherry. 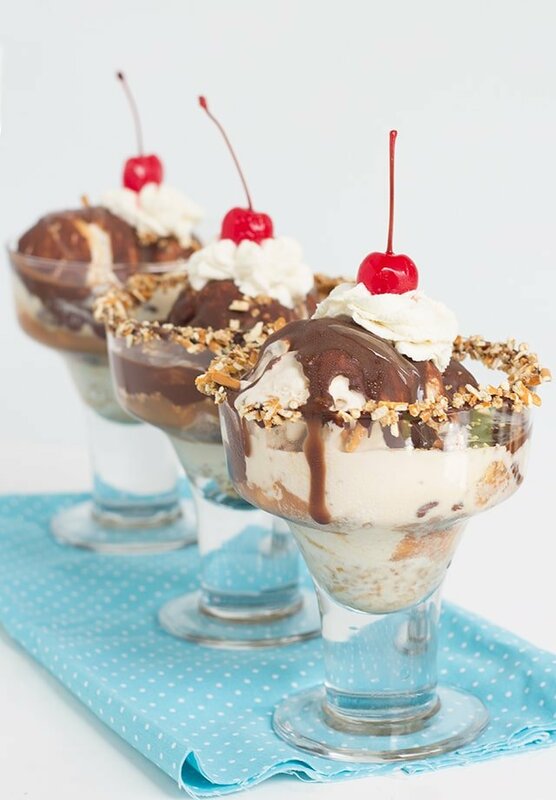 Be sure to check out my post for the perfect sundae!